I’ve lived abroad a few times in my life. The first time was when I was 21 years old and worked in New York for a year as an intern. The second time, I went to live in Agadir, Morocco, for three months. And the most recent time was in Costa Rica for six months. The locations and experiences were very different, but there was one thing they all had in common. The level of personal growth I experienced was phenomenal. I changed and grew in so many ways that I never would have experienced if I stayed settled and working in the UK. I’m grateful for all of these experiences that in some way shaped the person I am today. Having lived in London already, the transition to New York was quite easy. Especially because everyone spoke English. Looking back, I realise the largest part of why this experience was so much fun was having a large group of intern friends who were just as curious and eager to explore and enjoy NY as I was. Having friends to share adventures with is a wonderful thing. I loved the buzz of life, and knowing my time was limited meant I made the effort to do as much as I could as quickly as possible. Having to start a new life in another country somehow made me very assertive. I wasn’t so worried about what others thought of me as before. Morocco was a completely different experience. It felt very ‘foreign’. I didn’t understand any Arabic and I was forced to make use of my school French and develop my language skills. I enjoyed the hustle and bustle of a less modern world, like buying all of your fresh fruit and veg from a market stall, and appreciated how everyone took the time to relax. Agadir is based by the beach, a beautiful place, and it’s where I learned the importance of enjoying life, remembering to take things slowly once in a while and enjoy the beautiful views. Costa Rica is a very beautiful country, and the experience of living there was nothing like what I expected. Funnily enough, it’s where I learned to enjoy relaxing at the beach properly with friends. I used to find sitting at the beach quite boring before, but I finally understood the joy of spending hours in and near the sea. I loved living in Quepos, a little village near Manuel Antonio on the coast, for six weeks. I adored being surrounded by tropical forests, humming birds and I even had a tear in my eye when I saw a flock of wild scarlet macaws near my home. It makes me feel so awful when I think of how these beautiful red parrots are only seen in cages around the world. Being immersed in nature was an amazing experience, as were the horrific thunderstorms I witnessed (from the balcony) in rainy season. Truly magnificent! Moving to San Jose, the capital of Costa Rica, made me appreciate all the things I’d taken for granted about living in London. I kind of assumed that all capitals across the world were similar to London – international, full of work opportunities and great restaurants! It turns out that’s not the case. I found the language barrier to be a barrier in getting to know the locals, another reason to improve my Spanish skills. I also enjoyed the opportunity to visit rainforests, waterfalls, beaches and volcanoes around Costa Rica. One of the highlights was visiting Tortuguero and going kayaking for the first time… by myself… with a random dog that insisted on joining me! It was amazing and I loved ‘adventure dog’, he was awesome. I learned a lot from my time living abroad. Living somewhere is completely different to just visiting a place for a weekend or a week. You get a different feel for the place and understanding of the culture. I learned that people are kind and helpful, but most of all, I learned that I can rely on myself. That gave me a lot of confidence in myself – knowing that in a foreign situation you can and will always find a solution for what you need. I also learned and realised that sometimes you can’t control everything. Things happen in life, and you just have to go with the flow. I learned to let go of a lot of my life expectations, and sometimes the distance from ‘home’ also helped me to accept and let go of the past. Making the effort to step away from your everyday life helps you to see life from a different perspective. Somehow, travelling and living abroad really helped me to grow spiritually and accept everyone and everything more than before. Going to new places makes your senses come to life as you have to pay attention to everything around you. It’s a great opportunity to meet new people and experience different ways of living. I’m grateful that I’ve had these opportunities to experience personal growth, and I’m aware that this kind of growth would have been very limited if I hadn’t travelled and lived abroad. I realise that living abroad is usually a huge step, but I highly recommend it to anyone who is considering it. Most people actively manage their career growth, but I think personal growth is just as important in life, if not more. I decided to attend the three day Landmark Forum course (three and a bit days technically) while I was visiting New York. Reviews have compared it to a ‘cult’, but I think anyone who has been through it will know that it’s not. It’s just the result of people having major life realisations over a period of just a few days – which makes it pretty exciting stuff so they keep going on about it!! I think the best description, having completed it, is a course in ‘life skills’. I didn’t really know what to expect, and the decision to actually sign up was in the spur of the moment. The whole course takes place in a large room with screens and whiteboards at the front and a speaker who leads throughout. The hours on Friday, Saturday and Sunday are long: 9am – 10pm with a total of approximately 2.5 hours break per day. On Tuesday evening we only needed to attend for a few hours. I learned a lot and I’m sure it will be having a positive impact on my life and how I deal with people and situations in future. I’m glad I went and it was a great lesson in self improvement that I won’t be forgetting any time soon! 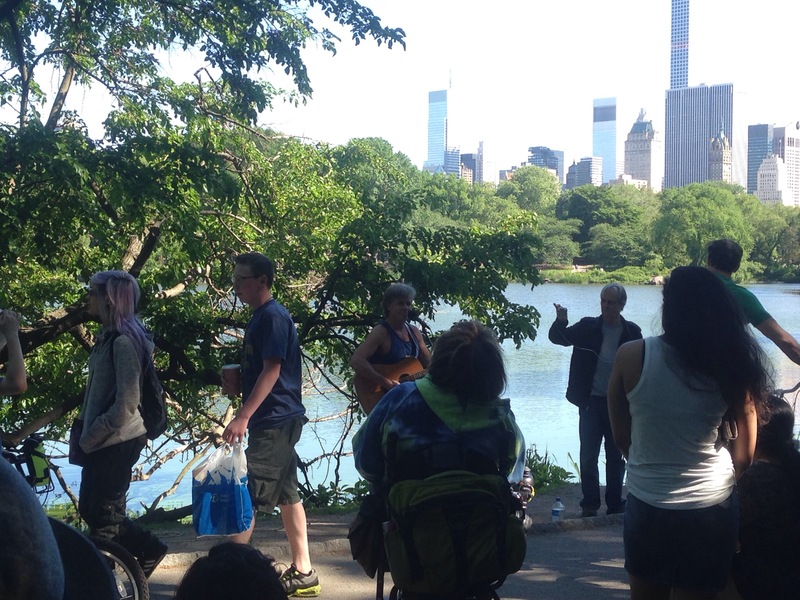 I had a wonderful time with friends listening to ‘that guitar man’ in Central Park yesterday. 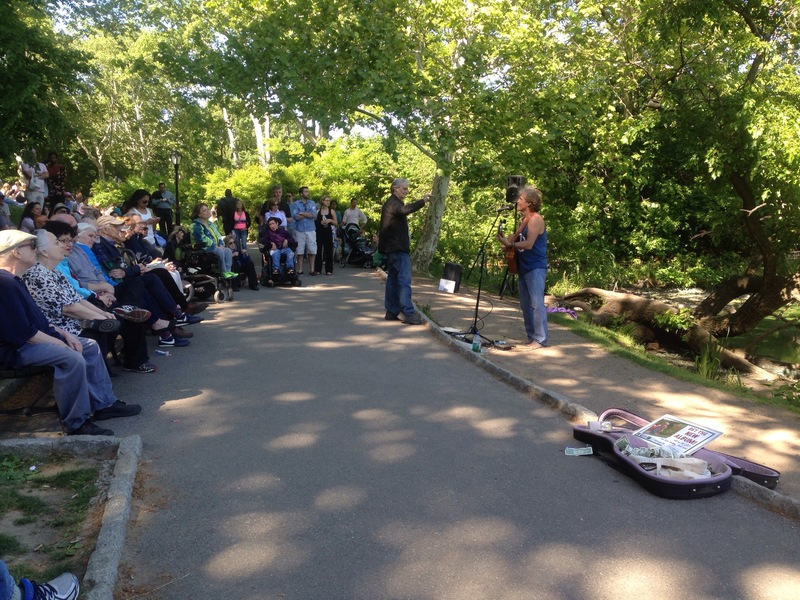 There was a good crowd of people and the singer is so good natured and a great performer!​ I hear he is there every Saturday in summer and has been for the past 20 years or so. Worth a visit!